To Cite: Ghafourian M, Shakunia A, Alavi S M, Kooti W, Shakerinejad G, et al. Seroepidemiology of Rubella in Women Under 25 Years Old Attending Medical Centers in Ahvaz, Iran in 2013, Jundishapur J Microbiol. 2015 ; 8(12):e27896. doi: 10.5812/jjm.27896. Background: Rubella is a mild viral infection affecting women of reproductive age, and the fetus in early pregnancy, leading to miscarriage, stillbirth and Congenital Rubella Syndrome. Objectives: The present study aimed to assess serum level of anti-rubella antibodies in women younger than 25 years attending medical centers in Ahvaz city. Patients and Methods: This descriptive cross-sectional study was conducted on 760 women younger than 25 years attending medical centers in Ahvaz. A sample of 3 mL of venous blood was taken from each woman and ELISA method was used to assess anti-rubella IgG levels. Antibody level more than 11 IU/mL was considered safe. Data was analyzed by SPSS software using Chi-square, ANOVA and Pearson Correlation tests. Results: Of total samples, 683 women (88.9%) had immunity against rubella, 80 (10.4%) no immunity and 5 (0.7%) intermediate levels of antibody. Immunity to rubella increased significantly with aging (P = 0.001) and a significant association was found between age and antibody titer (P = 0.001, r = 0.261). Conclusions: More than 95% of 15 to 25 year-old women (main reproductive age in Iran) are within acceptable immunity range. Level of immunity to rubella in women of reproductive age in this region appears satisfactory. Rubella is a mild viral infection in adults and children, with symptoms such as skin rash, fever and lymphadenopathy. Approximately 25% to 50% of cases can be subclinical. The importance of rubella in public health is that it may affect pregnant women, especially in the first trimester of pregnancy, which may cause miscarriage, stillbirth and Congenital Rubella Syndrome (CRS). The most important symptoms of CRS include severe mental and developmental retardation, cataract, hepatosplenomegaly, cardiac diseases, bone problems and deafness in the fetus (1). Up to two years of age, infants with CRS are considered a source of infection and virus can be found in their throat, urine and stool and susceptible people may be infected with rubella through contact with these infants (2). Maternal antibody (IgG) is transmitted to the fetus through placenta during pregnancy, making infants immune in the first few months of life (3). According to the World Health Organization, at least 100000 cases of CRS occur annually worldwide (4), but the actual figure may be twice as many (5). Many outbreaks were reported in Europe in the last century. 11500 cases of rubella were reported in 2002 - 2003 (6). In 2002 - 2004 outbreak in Russia, the prevalence of CRS reached 350 cases per 1000 (7). However, the highest frequencies in Europe were reported in Lithuania (3.44 per 100 people) and the Netherlands (2.23 per 100 people) (8). In Iran, rubella is endemic, and in recent years, its epidemiological pattern has changed due to immunization with MMR vaccine, which aimed to prevent congenital rubella syndrome. In Iran, until 2003, vaccination against rubella was not routinely performed and seroepidemiological studies revealed that 10% of susceptible women of reproductive age were exposed to rubella infection. Seroepidemiological assessment, following public vaccination against Measles-Rubella in 33 million 15 to 25 year-old people showed that more than 97% had gained immunity to rubella (9-12). Currently, rubella-measles-mumps vaccines are routinely administered together to 12 and 18 month-old children; however, because of changes in immunity level over time (13-15), it is necessary to conduct periodical assessment of immunity to rubella in susceptible age groups in various parts of the country to prevent CRS. The present study was conducted to assess serum anti-rubella antibody and immunity level in susceptible age groups younger than 25 years attending medical centers in Ahvaz. This descriptive cross-sectional study was conducted in 2013. Simple consecutive sampling was performed among those attending medical centers in Ahvaz; 760 healthy females younger than 25 years were selected. Women with viral infectious diseases, immunodeficiency or autoimmune diseases and those receiving immunosuppressive drugs were excluded. The participants were briefed and informed consents were obtained. A questionnaire containing demographic details, vaccination history and disease history was completed. A sample of 3 mL of venous blood was taken from each subject and serum was separated and kept frozen at -20°C until test. ELISA method and ELISA reader (Tecan) were used to assess subjects' immunity to rubella. Anti-rubella IgG level was measured using a kit from Trinity-Biotech Company, the USA, according to the manufacturer's instructions. According to the manufacturer's standards of antibody level, subjects were divided into three groups; more than 1.1 IU/mL as positive, 0.91-1.09 IU/mL borderline and less than 0.9 IU/mL negative. Data was analyzed by SPSS-15 software (Chicago, IL, USA) using descriptive statistics, Chi-square, ANOVA and Pearson Correlation tests at significant level P < 0.05. Participants' mean age was 14.25 ± 6.9 years. Of total subjects, 683 (88.9%) were immune to rubella, 80 (10.4%) had no immunity and 5 (0.7%) intermediate levels of antibody. Comparison of immunity to rubella in different age groups (Table 1) showed that immunity increased significantly with aging (P = 0.001). According to Figure 1, mean anti-rubella antibody titer increased with aging and there was a significant difference in mean serum antibody titer between age groups (P = 0.001). The highest mean serum antibody titer was found in 21 - 25 year-old age group (110.2 IU/mL) and the lowest in 6 - 10 year-old (56.9 IU/mL). aData are presented as No.(%). Comparison of levels of immunity and mean antibody titer in study subjects (Figure 2) showed that despite fluctuations, they generally increase with aging. According to Pearson correlation test, a significant association was observed between immunity to rubella and age (P = 0.001, r = 0.254) and also between age and mean anti-rubella antibody titer (P = 0.001, r = 0.179). Chi-square test showed significantly greater immunity to rubella in women older than 15 years (95.7%) compared to younger subjects (83.3%) (P = 0.0001). Most importantly, over 95% of 15 - 25 year-old women in the present study (main reproductive age in Iran) had immunity to rubella. This agrees with the results obtained in Izadi study, which indicated mean national immunity to rubella in 15 - 30 year-old women as 85%-95% (16). No significant difference was found between the present study results and other studies in different parts of the country. Studies reported immunity of women of reproductive age to rubella as 93 % in Sari (17), 96.2 % in Shiraz (18), 97.4% in Tehran (19) and 98.5% in Mashhad (20). Countrywide assessment of immunity to rubella in women of reproductive age shows over 95% immunity in most areas, indicating efficacy of vaccination in providing appropriate immunity in target groups. Studies conducted in different parts of Iran indicate successful countrywide vaccination against rubella, in line with targets set by the World Health Organization for elimination of rubella and control of CRS complications. Several studies conducted worldwide on epidemiology of rubella, aiming to assess seropositivity prevalence and found various levels of immunity and epidemiology in different parts of the world and reported mean level of immunity in different societies as 66% - 100% (21). In a study in Japan, 27% of girls below 18 years had no anti-rubella antibody titer compared to 17% of girls below 15 years in the present study (22). The disagreement in results could be perhaps attributed to specific conditions and climates. In a study in Brazil, positive antibody titer was reported as 76% (23). Other studies in Turkey (24), India (25), Syria (26), Sudan (27) and Burkina-Faso (28) reported anti-rubella antibody titers as 81.8%, 87.2%, 85.6%, 95.1% and 95%, respectively. In Iran, several studies were conducted in different age groups before national vaccination in 2003 and reported immunity of women of reproductive age as 78%-94% (29-32), which showed high susceptibility of this age group to rubella and potential CRS in infants born of these women. In December 2003, 32 million doses of rubella and measles vaccines were inoculated to 5 - 25 year-old people in Iran. Given the importance of rubella, especially CRS, the World Health Organization aims to eliminate this disease by recommending two strategies of increasing MMR vaccination coverage over 95% and booster doses. The role of national vaccination has been confirmed in various studies (9). In a study by Shamsizadeh and Makvandi in 2002, immune level in 15 - 43 year-old age group in Ahvaz was 93% (33). This level increased to over 97% countrywide, following national vaccination in 2003, and national incidence rate reached below 0.3 in one million by 2012. The present study results showed increased immunity with aging, and in the reproductive age group 21-25 years, immunity level reached as high as 98.8%. In Iran, Hatami et al. 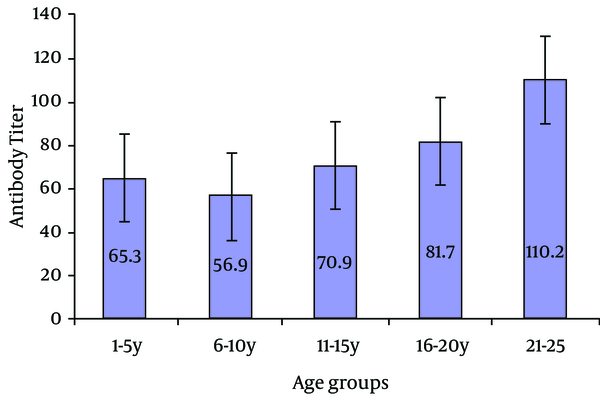 reported immunity of 99.3% in 20 - 25 year-old age group (34), which agrees with the present study and Soleimanjahi et al. (35) results. The present study results showed increased anti-rubella antibody with aging, which is probably due to higher risk of disease or contact with virus with aging, as confirmed in studies by Hatami et al. (9), Mahmoudi and Vahedi (20) and Fokunang et al. (36). MR and MMR vaccination program in up to 6-year-old children has played a major role in reducing nationwide cases of rubella and CRS. The present study results indicated that more than 95% of 15 to 25 year-old women (main reproductive age in Iran) had acceptable immunity against rubella. Therefore, immunity increases with aging and a high level of immunity (98.8%) is reached in 21 - 25 year-old age group. Level of immunity to rubella in women of reproductive age in this region appears satisfactory. Preferably, anti-rubella antibody titer should be measured before pregnancy or marriage and vaccination should be performed in cases of negative titer. Given that rubella infection and vaccination do not provide lifelong immunity, it is recommended to conduct seroepidemiological surveys in different parts of Iran every few years. Furthermore, implementation of an efficient care system can be very helpful. The results presented here are products of a common project supported by a grant number 89114 and approved by ethics committee number 229 in Ahvaz Jundishapur University of Medical Sciences and Jahade Daneshgahi of Khuzestan. Authors’ Contribution: Study concept, design and critical revision of the manuscript for important intellectual content: Mehri Ghafourian, Abdolhussein Shakunia, Seyed Mohammad Alavi, Wesam Kooti; drafting of the manuscript and advisor and conducting the experiments: Ghodratollahe Shakerinejad, Amirarsalan Serajian, Zahra Chinipardaz. Funding/Support: This study was supported by Ahvaz Jundishapur University of Medical Sciences and Jahade Daneshgahi of Khuzestan.